Well over 100 years ago, in the 1880s, the American naturalist and glacier specialist John Muir explored parts of Southeastern Alaska by canoe with the local Tlingit Indians. At one point, a small black dog attached himself to Muir, and trekked with him over the mountains of glacial ice that Muir was so intent on studying. At first, Muir wanted nothing to do with the dog, but the little tyke was so hardy, so brave and adventurous, that he impressed Muir with his abilities and in time the two became inseparable. Muir named him ‘Stickeen’, a local Indian name. 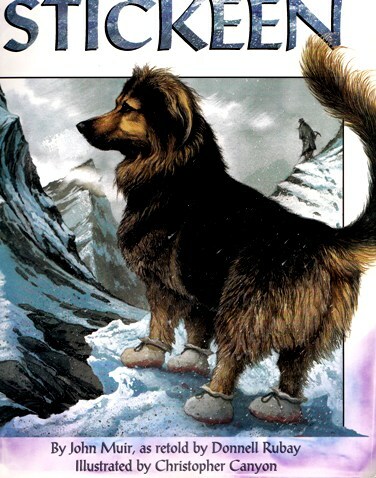 What Stickeen could do was amazing, and Muir told the story of the dog many times to many people. Eventually Muir wrote the the book, Stickeen: The Story of a Dog (Boston: Houghton-Mifflin, 1909). The version of the story reviewed here is based solidly on Muir’s tale, but retold and admirably illustrated for a modern audience. At a crucial point in crossing a dangerous glacier, man and dog had to cross a huge crevasse, a giant bottomless crack in the ice. The only way across was on a precariously dangerous ice bridge. They both knew it was not safe, but they had no other choice. Muir went first, cutting steps in the ice with his ice axe. The little dog followed, fearfully, hesitatingly…, gradually reaching the far side, where Muir coaxed him up the last steep incline. Dogs are not good climbers, but Stickeen had no choice but to scramble up the ice to the top of the crevasse, where Muir was waiting. “Well done! Well done little boy! Brave boy!” I cried, trying to catch and caress him. But he would not be caught. He darted hither and thither in his great joy, screaming and shouting, swirling round and round in giddy loops and circles like a leaf in a whirlwind, lying down and rolling over, then jumping up to yelp and cry again! It’s a powerful little story. Children from about 8 to 12 years old will certainly enjoy reading it, and younger children will enjoy having this remarkable adventure tale read aloud to them. Stickeen: John Muir and the Brave Little Dog, by John Muir, as retold by Donnell Rubay. Scholastic Inc., 1998, 30 pages. Illustrated in color by Christopher Canyon. ISBN 0.429.08744.9. This entry was posted in BOOK REVIEW, Childrens' Book, Uncategorized and tagged Books about Dogs. Bookmark the permalink.